A leading member of the Barbizon School of landscape painting, Millet is best known for his rural Realism which highlighted the harsh working conditions of the peasants. 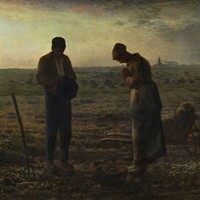 His greatest genre paintings include: The Angelus (1859) and The Gleaners (1857), The Sower (1850), and Man with a Hoe (1862), all of which were highly controversial at a time when France was still trying to heal its divisions in the aftermath of the French Revolution, although Millet was more of a humanitarian than a political artist. In this respect he was quite different to the avowedly left-wing painter Gustave Courbet (1819-77), whose works like The Artist's Studio (1855) were unashamedly political. However, Millet did share with Courbet the desire to honour the working men and women of France, and his pictures impart a new monumentality to their lives. For him, the peasantry and the countryside were part of a timeless rural world and a unique part of the heritage of France. They were also closest to nature and therefore to God. Other important French Realist artists included Camille Corot (1796-1875), Honore Daumier (1808-79), and Jules Breton (1827-1906). For more, please see: Realism to Impressionism (c.1830-1900). This unusual example of Christian art expresses a profound sense of religious devotion, and became one of the most widely reproduced religious paintings of the 19th century, with prints displayed by thousands of devout householders across France. However, Millet painted it from a sense of nostalgia rather than from any strong religious feeling. In 1865, he admitted that the idea for The Angelus came to him as a result of a childhood memory of his grandmother, who always insisted that the family stop work in the fields when they heard the church bell ringing for the Angelus. It was reportedly commissioned by the American art collector Thomas Gold Appleton (1812-84), although he never collected it from the artist. Millet sold it in 1859 for less than 1,000 francs (roughly $200). Thirty years later it was sold to the Parisian philanthropist, Hippolyte Chauchard (1821-1909), for 750,000 francs. As the name suggests, the painting depicts two peasant figures - a man and a woman - who have stopped working for a few minutes, in order to recite the Angelus, a prayer (traditionally recited three times a day in Catholic countries) which commemorates the Annunciation. The name "Angelus", which means "angel" in Latin, is the opening word of the Annunciation: "Angelus Domini nuntiavit Mariae" or "the Angel of the Lord announced to Mary". The man has removed his beret and bows his head in silent prayer, as does the woman. The scene is set during the potato harvest, just outside the village of Chailly-en-Biere in Barbizon, whose church steeple is visible in the distance. The couple were in the middle of digging potatoes when they heard the church bells, and all their tools are strewn about them, including sacks, pitchfork, basket of potatoes, and wheelbarrow. It is unclear what relationship exists between the couple - husband and wife, working colleagues, or farmer and servant. An 1889 sales catalogue described them simply as "a young peasant and his companion". By depicting these two silent and anonymous figures, in the middle of a vast cultivated plain, with only a few simple tools to help them scratch a living from the soil, Millet highlights the backbreaking life of the rural worker with its daily grind of physical toil which endures throughout the seasons. At the same time, the moment of silence reminds us of our inescapable connection with the Almighty and our insignificance beside him. It is this combination that makes it one of the great masterpieces of French painting of the nineteenth century. The Spanish Surrealist painter Salvador Dali (1904-89) became obsessed by Millet's Angelus, which inspired him to paint numerous works including: The Architectonic Angelus of Millet (1933) and Gala and the Angelus of Millet Immediately Preceding the Arrival of the Conic Anamorphoses (1933). He also wrote a book entitled "The Tragic Myth of Millet's Angelus" (1938). He was convinced that Millet's work represented a funeral scene, not just a moment of prayer. Disbelieved for years, he was finally vindicated when the Louvre arranged an X-ray examination of the canvas, only to find the outline of a small coffin underneath the basket of potatoes. At the same time, analysts discovered that the church tower in the distance, was added later. It seems that Millet originally painted a burial - perhaps a rural version of Courbet's famous painting A Burial at Ornans (1850) - but then converted it to a recitation of the Angelus, complete with a visible church bell tower.  The Death of Sardanapalus (1827) by Delacroix. Louvre, Paris; Philadephia Museum of Art.  Liberty Leading the People (1830) by Delacroix.  Portrait of Madame Moitessier (1844-56) by J.A.D. Ingres.  The Bellelli Family (1858-67) by Degas.  Family Reunion (1867) by Frederic Bazille.  Dejeuner sur l'herbe (1863) by Edouard Manet.  Olympia (1863) by Edouard Manet.  For analysis of other Realist paintings, see: Homepage.